The text of the Agreement and the declarations annexed to the Final Act drawn up in Danish and annexed to this Protocol are authentic in the same way as the original texts. Denmark shall apply in respect of Malta the reductions in customs duties and charges having equivalent effect provided for in Articles 1, 2, 3 and 5 of Annex I to the Agreement and at rates shown therein. However, the duties thus reduced may in no case be lower than those applied by Denmark in respect of the Community as originally constituted. 1. Ireland and the United Kingdom shall apply to imports originating in Malta the customs duties and rules of origin applied in respect of Malta at the time of entry into force of this Protocol. This provision shall apply until the entry into force of the provisions governing the second stage but not later than 30 June 1977. 2. Products originating in Malta conforming to the provisions of the Protocol annexed in respect of which the rates of customs duties and charges having equivalent effect, reduced in accordance with Articles 1, 2, 3 and 5 of Annex I to the Agreement and calculated in accordance with Article 5, and in accordance with Articles 13 and 14 of this Protocol, and calculated in accordance with Article 15 are lower than the customs duties and charges having equivalent effect applied by Ireland and the United Kingdom in respect of Malta at the time of entry into force of this Protocol may be imported into Ireland and the United Kingdom at the reduced rates of customs duties and charges having equivalent effect set out in the Agreement. However, the duties thus reduced may in no case be lower than those applied by Ireland and the United Kingdom in respect of the Community as originally constituted. 3. Should the progressive alignment of the Irish and the United Kingdom tariffs on the Common Customs Tariff result in the application by Ireland and the United Kingdom as regards Malta of customs duties lower than those applied in respect of that State at the time this Protocol enters into force, the first-mentioned customs duties shall be applied. 1. The rates on the basis of which the new Member States apply to Malta the reductions provided for in Article 3 and Article 4 (2) shall be those which they apply at the time in respect of third countries. 2. By way of derogation from the provisions of Article 3 and Article 4 (2), should the application of these provisions temporarily result in tariff movements away from alignment on the final duty, the new Member States may maintain their duties until the level of these duties has been reached on the occasion of a subsequent alignment, or they may apply the duty resulting from a subsequent alignment as soon as this alignment reaches or passes the said level. 1. The reduced duties calculated in accordance with Articles 3, 4 and 5 shall be applied by rounding to the first decimal place. 2. Subject to the effect to be given by the Community to Article 39 (5) of the Act of Accession as regards the specific duties or the specific part of the mixed duties of the customs tariffs of Ireland and the United Kingdom, the provisions of Articles 4 and 5 shall be applied by rounding to the fourth place of decimals. Where, for the products listed in Annex I to the Agreement, the new Member States apply duties comprising protective and fiscal elements, only the protective elements of those duties, within the meaning of Article 38 of the Act of Accession, shall be aligned on the preferential duties set out in that Annex and reduced as provided in Articles 3, 4 and 5. The arrangements which Denmark applies in respect of Malta, in application of Article 7 of Annex I to the Agreement, may under no circumstances be more favourable than those which it applies in respect of the Community as originally constituted. 1. Ireland and the United Kingdom shall apply to imports originating in Malta the quantitative restrictions in force in respect of Malta at the time of entry into force of this Protocol. 2. The arrangements which Ireland and the United Kingdom apply in respect of Malta may not be less favourable than those provided for in Article 7 of Annex I to the Agreement. 3. However, the quantitative restrictions in force in Ireland which are referred to in Protocol 7 of the Act of Accession shall be abolished as regards Malta in accordance with procedures to be determined, account being taken of the provisions of the above-mentioned Protocol. Malta shall apply in respect of Denmark the reductions in customs duties and charges having equivalent effect provided for in Articles 1, 2, 3 and 4 of Annex II to the Agreement at the rates and in accordance with the timetable set out therein. 1. Malta shall continue to apply to imports originating in Ireland and the United Kingdom the tariff and rules of origin applied prior to the Agreement, without prejudice to the protective clauses of that Agreement. 2. 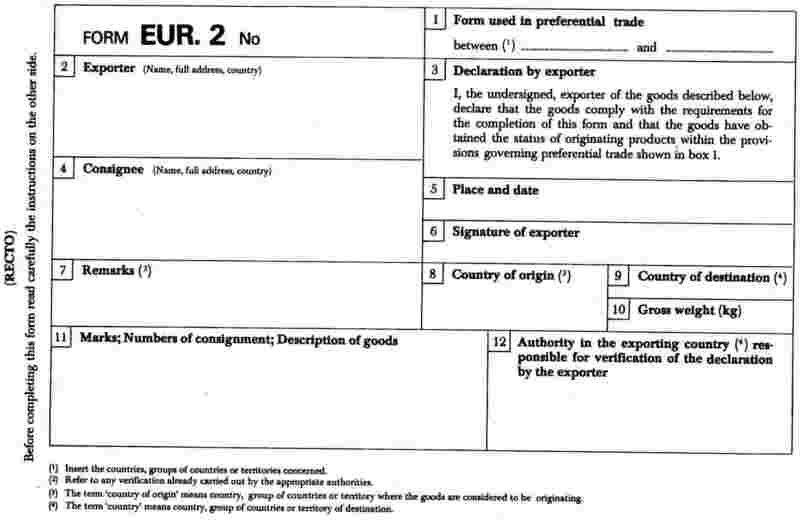 Products originating in Ireland and the United Kingdom in respect of which the rates of customs duties and charges having equivalent effect, reduced in accordance with Article 1 of Annex II to the Agreement, are lower than the customs duties and charges having equivalent effect applied by Malta at the time of entry into force of this Protocol may be imported into Malta at the reduced rates of customs duties and charges having equivalent effect in accordance with the timetable set out in the Agreement and under the rules of origin appropriate thereto. The Protocol annexed replaces the Protocol relating to the definition of the concept of ‘originating products’ and to methods of administrative cooperation referred to in Article 7 of the Agreement. 1. The rates of reduction specified in Articles 13 and 14 shall apply to customs duties actually applied in respect of third countries. 2. Article 4 shall apply to imports into Ireland and the United Kingdom of the products referred to in Articles 13 and 14. 3. However, the duties applied by Denmark as a result of the reductions referred to in paragraph 1 may in no case be lower than those applied by the said country to the Community as originally constituted. 4. By way of derogation from paragraph 1, should the application thereof temporarily result in tariff movements away from alignment on the final duty, Denmark, Ireland and the United Kingdom may maintain their duties until the level of these duties has been reached on the occasion of a subsequent alignment, or they may apply the duty which would result from a subsequent alignment as soon as a tariff movement reaches or passes the said level. 5. The reduced duties calculated in accordance with paragraph 1 shall be applied rounded to the first decimal place. Subject to the application by the Community of Article 39 (5) of the Act of Accession, as regards the specific duties or the specific part of the mixed duties in the Irish and United Kingdom Customs Tariffs, paragraph 1 shall be applied by rounding to the fourth decimal place. 1. Should specific rules be introduced as a result of implementation of its agricultural policy or modification of the existing rules, or should the provisions on the implementation of its agricultural policy be modified or developed, the Community may modify the arrangements laid down in this Protocol in respect of the products concerned. In such cases the Community shall take appropriate account of the interests of Malta. 2. If the Community, in applying paragraph 1, amends the arrangements made by this Protocol for products covered by Annex II to the Treaty establishing the European Economic Community, it shall accord imports originating in Malta an advantage comparable to that provided for in this Protocol. 3. Consultations may be held within the Association Council on the application of this Article. From the beginning of 1978 in accordance with the procedure adopted for negotiating the Agreement, the Contracting Parties shall review the results of the agricultural provisions as well as any improvements which could be made as from 1 January 1979 on the basis of the experience gained during the functioning of the Agreement and of the objectives defined therein. The Community and Malta shall institute cooperation with the aim of contributing to the development of Malta by efforts complementary to those made by Malta itself and of strengthening existing economic links on as broad a basis as possible for their mutual benefit. the importance of promoting regional cooperation between Malta and other States. exchange of information on the economic and financial situation, and on the trend thereof, as required for the proper functioning of the Agreement. 1. The Association Council shall define periodically the guidelines of cooperation for the purpose of attaining the objectives set out in the Agreement. 2. The Association Council shall be responsible for seeking ways and means of establishing cooperation in the areas defined in Article 20. To that end it is empowered to make decisions. The Community shall participate in the financing of any projects to promote the development of Malta under the conditions laid down in the Financial Protocol. The Contracting Parties shall facilitate the proper performance of cooperation and investment contracts which are of interest to both parties and come within the framework of the Agreement. This Protocol and its Annex form an integral part of the Agreement establishing an association between the European Economic Community and Malta. 1. This Protocol shall require ratification, acceptance or approval in accordance with the procedures in force in each of the Contracting Parties who shall notify each other of the completion of the procedures necessary to that end. 2. This Protocol shall enter into force on the first day of the second month following the date on which the notifications referred to in paragraph 1 have been effected. This Protocol is drawn up in two copies in the Danish, Dutch, English, French, German and Italian languages, each of these texts being equally authentic. Zu Urkund dessen haben die unterzeichneten Bevollmachtigten ihre Unterschriften unter dieses Protokoll gesetzt. Udfærdiget i Bruxelles, den fjerde marts nitten hundrede og seksoghalvfjerds. Geschehen zu Brüssel am vierten März neunzehnhundertsechsundsiebzig. Done at Brussels on the fourth day of March in the year one thousand nine hundred and seventy-six. Fait à Bruxelles, le quatre mars mil neuf cent soixante-seize. Fatto a Bruxelles, addì quattro marzo millenovecentosettantasei. Gedaan te Brussel, de vierde maart negentienhonderd zesenzeventig. products obtained in the Community, in the manufacture of which products other than those wholly obtained in the Community are used, provided that the said products have undergone sufficient working or processing within the meaning of Article 3. This condition shall not apply, however, to products which, within the meaning of this Protocol, originate in Malta. The products in List C in Annex IV shall be temporarily excluded from the scope of this Protocol. goods produced there exclusively from products specified in subparagraphs (a) to (i). working or processing specified in List B in Annex III. ‘Sections’, ‘Chapters’ and ‘headings’ shall mean the sections, chapters and headings in the Brussels Nomenclature for the classification of goods in customs tariffs. 2. When, for a given product obtained, a percentage rule limits in Lists A and B the value of the materials and parts which can be used, the total value of these materials and parts, whether or not they have changed heading in the course of the working, processing or assembly within the limits and under the conditions laid down in each of those two lists, may not exceed, in relation to the value of the product obtained, the value corresponding either to the common rate, if the rates are identical in both lists, or to the higher of the two if they are different. the ex-works price of the goods obtained, less internal taxes refunded or refundable on exportation. 1. For the purpose of implementing Article 1, originating products whose transport is effected without entering into territory other than that of the Contracting Parties are considered as transported directly from Malta to the Community or from the Community to Malta. However, goods originating in Malta or in the Community and constituting one single consignment which is not split up may be transported through territory other than that of the Contracting Parties with, should the occasion arise, transhipment or temporary warehousing in such territory, provided that the crossing of the latter territory is justified for geographical reasons and that the goods have remained under the surveillance of the customs authorities in the country of transit or warehousing, that they have not entered into commerce of such countries nor been delivered for home use there and have not undergone operations other than unloading, reloading or any operation designed to maintain them in good condition. or failing these, any substantiating documents. 1. Evidence of originating status, within the meaning of this Protocol, of products is given by a movement certificate EUR. 1 of which a specimen is given in Annex V to this Protocol. 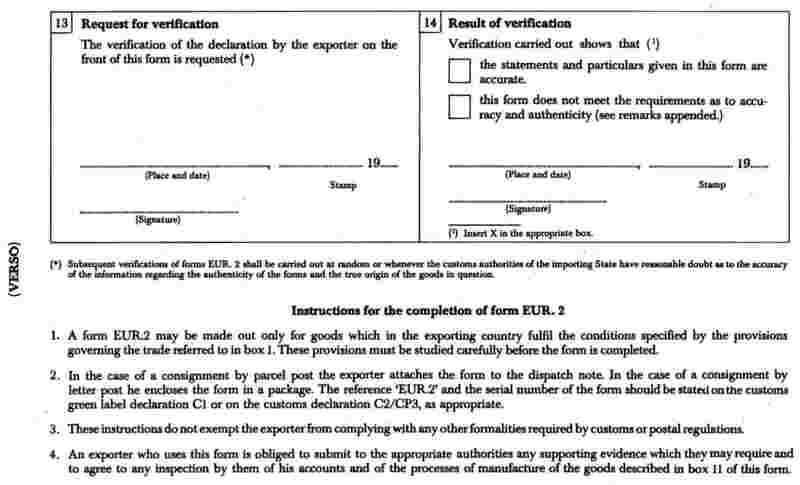 However, the evidence of originating status, within the meaning of this Protocol, of products which form the subject of postal consignments (including parcels), provided that they consist only of originating products and that the value does not exceed 1 000 units of account per consignment, may be given by a form EUR. 2, of which a specimen is given in Annex VI to this Protocol. The unit of account (u. a.) has a value of 0.88867088 gramme of fine gold. Should the unit of account be changed, the Contracting Parties shall make contact with each other at the level of the Association Council to redefine the value in terms of gold. 2. 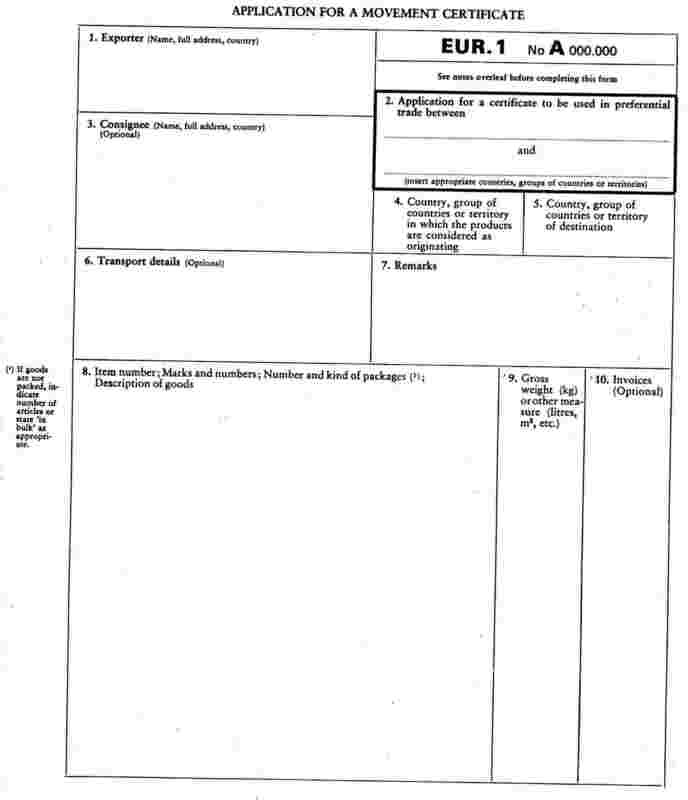 Without prejudice to Article 3 (3), where, at the request of the person declaring the goods at the customs, a dismantled or non-assembled article falling within Chapter 84 or 85 of the Brussels Nomenclature is imported by instalments on the conditions laid down by the competent authorities, it shall be considered to be a single article and a movement certificate may be submitted for the whole article upon importation of the first instalment. 3. Accessories, spare parts and tools dispatched with a piece of equipment, machine, apparatus or vehicle which are part of the normal equipment and included in the price thereof or are not separately invoiced are regarded as one with the piece of equipment, machine, apparatus or vehicle in question. 1. A movement certificate EUR. 1 shall be issued by the customs authorities of the exporting State when the goods to which it relates are exported. It shall be made available to the exporter as soon as actual exportation has been effected or ensured. 2. In exceptional circumstances a movement certificate EUR. 1 may also be issued after exportation of the goods to which it relates if it was not issued at the time of exportation because of errors or involuntary ommissions or special circumstances. In this case, the certificate shall bear a special reference to the conditions in which it was issued. 3. A movement certificate EUR. 1 shall be issued only on application having been made in writing by the exporter. Such application shall be made on a form, of which a specimen is given in Annex V to this Protocol, which shall be completed in accordance with this Protocol. 4. A movement certificate EUR. 1 may be issued only where it can serve as the documentary evidence required for the purpose of implementing the Agreement. 5. Applications for movement certificates EUR. 1 must be preserved for at least two years by the customs authorities of the exporting country. 1. The movement certificate EUR. 1 shall be issued by the customs authorities of the exporting State, if the goods can be considered ‘originating products’ within the meaning of this Protocol. 2. For the purpose of verifying whether the conditions stated in paragraph 1 have been met, the customs authorities shall have the right to call for any documentary evidence or to carry out any check which they consider appropriate. 3. It shall be the responsibility of the customs authorities of the exporting State to ensure that the forms referred to in Article 9 are duly completed. In particular, they shall check whether the space reserved for the description of the goods has been completed in such a manner as to exclude all possibility of fraudulent additions. To this end, the description of the goods must be indicated without leaving any blank lines. Where the space is not completely filled a horizontal line must be drawn below the last line of the description, the empty space being crossed through. 4. The date of issue of the movement certificate must be indicated in the part of the certificate reserved for the customs authorities. Movement certificates EUR. 1 shall be made out on the form of which a specimen is given in Annex V to this Protocol. This form shall be printed in one or more of the languages in which the Agreement is drawn up. Certificates shall be made out in one of these languages and in accordance with the provisions of the domestic law of the exporting State; if they are handwritten, they shall be completed in ink and in capital letters. Each certificate shall measure 210 × 297 mm, a tolerance of up to plus 8 or minus 5 mm in the length may be allowed. The paper used must be white-sized writing paper not containing mechanical pulp and weighing not less than 25 g/m2. It shall have a printed green guilloche pattern background making any falsification by mechanical or chemical means apparent to the eye. The exporting States may reserve the right to print the certificates themselves or may have them printed by approved printers. In the latter case, each certificate must include a reference to such approval. Each certificate must bear the name and address of the printer or a mark by which the printer can be identified. It shall also bear a serial number, either printed or not, by which it can be identified. 1. Under the responsibility of the exporter, he or his authorized representative shall request the issue of a movement certificate EUR. 1. 2. 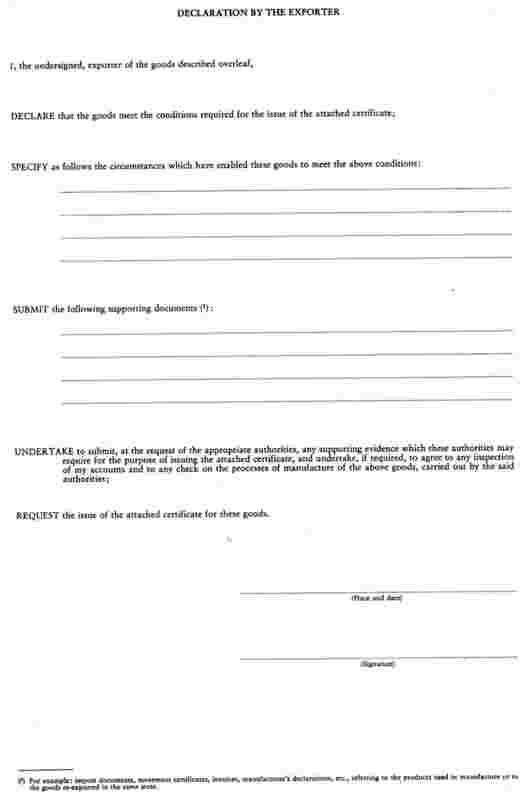 The exporter or his representative shall submit with his request any appropriate supporting document proving that the goods to be exported are such as to qualify for the issue of a movement certificate EUR. 1. A movement certificate EUR. 1 must be submitted, within five months of the date of issue by the customs authorities of the exporting State, to the customs authorities of the importing State where the goods are entered. Movement certificates EUR. 1 shall be submitted to customs authorities in the importing State, in accordance with the procedures laid down by that State. The said authorities may require a translation of a certificate. They may also require the import declaration to be accompanied by a statement from the importer to the effect that the goods meet the conditions required for the implementation of the Agreement. 1. A movement certificate EUR. 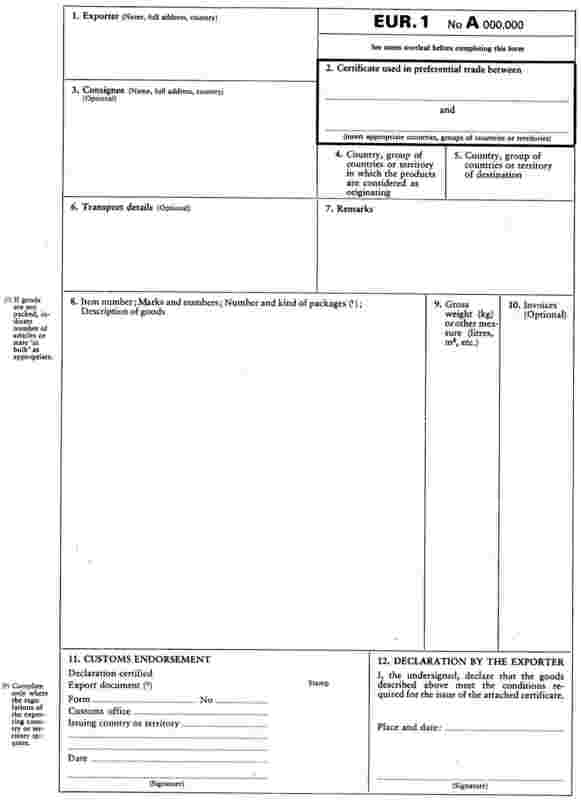 1 which is submitted to the customs authorities of the importing State after the final date for presentation specified in Article 11, may be accepted for the purpose of applying preferential treatment, where the failure to submit the certificate by the final date set is due to reasons of force majeure or exceptional circumstances. 2. In other cases of belated presentation, the customs authorities of the importing State may accept the certificates where the goods have been submitted to them before the said final date. The discovery of slight discrepancies between the statements made in the movement certificate EUR. 1 and those made in the documents submitted to the customs office for the purpose of carrying out the formalities for importing the goods shall not ipso facto render the certificate null and void if it is duly established that the certificate does correspond to the goods submitted. It shall always be possible to replace one or more movement certificates EUR. 1 by one or more other movement certificates EUR. 1 provided that this is done at the customs office where the goods are located. Form EUR. 2, a specimen of which is given in Annex VI, shall be completed by the exporter or, under his responsibility, by his authorized representative. It shall be made out in one of the languages in which the Agreement is drawn up and in accordance with the provisions of the domestic law of the exporting State. 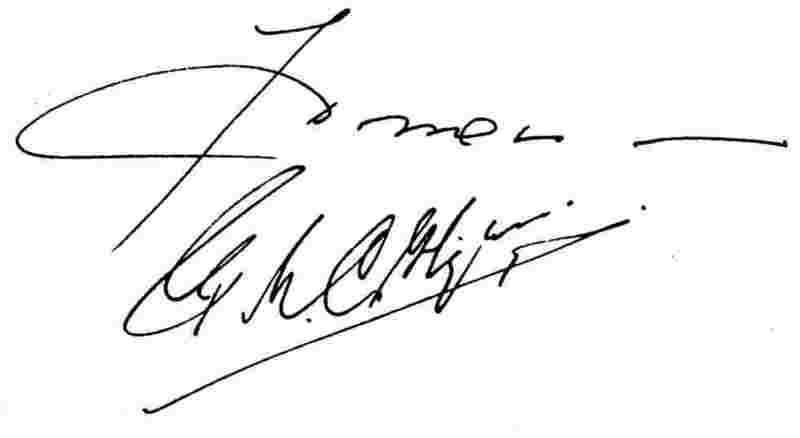 If it is handwritten it must be completed in ink and in capital letters. If the goods contained in the consignment have already been subject to verification in the exporting country by reference to the definition of the concept of ‘originating products’ the exporter may refer to this check in the ‘Remarks’ box of form EUR. 2. Form EUR. 2 shall be 210 × 148 mm. A tolerance of up to plus 8 or minus 5 mm in the length may be allowed. The paper used shall be white paper dressed for writing not containing mechanical pulp and weighing not less than 64 g/m2. The exporting States may reserve the right to print the forms themselves or may have them printed by printers they have approved. In the latter case each form must include a reference to such approval. In addition, the form must bear the distinctive sign attributed to the approved printer and a serial number, either printed or not, by which it can be identified. A form EUR. 2 shall be completed for each postal consignment. These provisions do not exempt exporters from complying with any other formalities required by customs or postal regulations. 1. Goods sent as small packages to private persons or forming part of travellers' personal luggage shall be admitted as originating products without requiring the production of a movement certificate EUR. 1 or the completion of a form EUR. 2, provided that such goods are not imported by way of trade and have been declared as meeting the conditions required for the application of these provisions, and where there is no doubt as to the veracity of such declaration. 2. Importations which are occasional and consist solely of goods for the personal use of the recipients or travellers or their families shall not be considered as importations by way of trade if it is evident from the nature and quantity of the goods that no commercial purpose is in view. Furthermore, the total value of these goods must not exceed 60 units of account in the case of small packages or 200 units of account in the case of the contents of travellers' personal luggage. the goods have not, since they were consigned for exhibition, been used for any purpose other than demonstration at the exhibition. 2. A movement certificate EUR. 1 must be produced to the customs authorities in the normal manner. The name and address of the exhibition must be indicated thereon. Where necessary, additional documentary evidence of the nature of the goods and the conditions under which they have been exhibited may be required. 3. Paragraph 1 shall apply to any trade, industrial, agricultural or crafts exhibition, fair or similar public show or display which is not organized for private purposes in shops or business premises with a view to the sale of foreign goods, and during which the goods remain under customs control. certify that no movement certificate EUR. 1 was issued at the time of exportation of the goods in question, and state the reasons. 2. The customs authorities may issue a movement certificate EUR. 1 retrospectively only after verifying that the information supplied in the exporter's application agrees with that in the corresponding file. Certificates issued retrospectively must be endorsed with one of the following phrases: ‘NACHTRÄGLICH AUSGESTELLT’, ‘DÉLIVRÉ A POSTERIORI’, ‘RILASCIATO A POSTERIORI’‘AFGEGEVEN A POSTERIORI’, ‘ISSUED RETROSPECTIVELY’, ‘UDSTEDT EFTERFØLGENDE’. In the event of the theft, loss or destruction of a movement certificate EUR. 1, the exporter may apply to the customs authorities which issued it for a duplicate made out on the basis of the export documents in their possession. The duplicate issued in this way must be endorsed with one of the following words: ‘DUPLIKAT’, ‘DUPLICATA’, ‘DUPLICATO’, ‘DUPLICAAT’, ‘DUPLICATE’. Malta and the Community shall take all necessary steps to ensure that goods traded under cover of a movement certificate EUR. 1, and which in the course of transport use a free zone situated in their territory, are not replaced by other goods and that they do not undergo handling other than normal operations designed to prevent their deterioration. In order to ensure the proper application of this title, Malta and the Community shall assist each other, through their respective customs administrations, in checking the authenticity of movement certificates EUR. 1 and the accuracy of the information concerning the actual origin of the products concerned and the declarations by exporters on forms EUR. 2. Penalties shall be imposed on any person who, in order to enable goods to be accepted as eligible for preferential treatment, draws up or causes to be drawn up, either a document which contains incorrect particulars for the purpose of obtaining a movement certificate EUR. 1 or a form EUR. 2 containing incorrect particulars. 1. 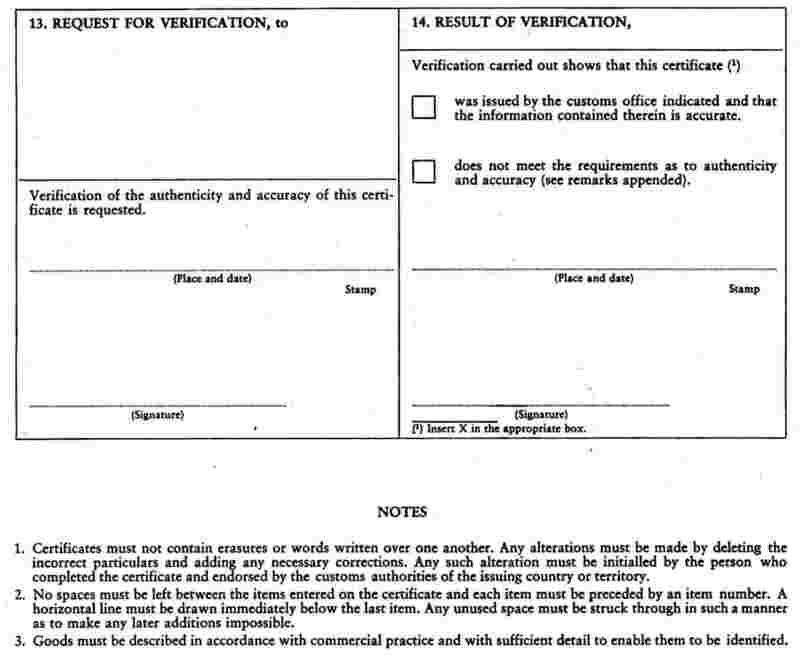 Subsequent verifications of movement certificates EUR. 1 and of forms EUR. 2 shall be carried out at random or whenever the customs authorities of the importing State have reasonable doubt as to the authenticity of the document or the accuracy of the information regarding the true origin of the goods in question. 2. For the purpose of implementing paragraph 1, the customs authorities of the importing State shall return the movement certificate EUR. 1 or the form EUR. 2, or a photocopy thereof, to the customs authorities of the exporting State, giving, where appropriate, the reasons of form or substance for an inquiry. The invoice, if it has been submitted, or a copy thereof shall be attached to the form EUR. 2 and the customs authorities shall forward any information that has been obtained suggesting that the particulars given on the said certificate or the said form are inaccurate. If the customs authorities of the importing State decide to suspend execution of the Agreement while awaiting the results of the verification, they shall offer to release the goods to the importer subject to any precautionary measures judged necessary. 3. The customs authorities of the importing State shall be informed of the results of the verification as quickly as possible. These results must be such as to make it possible to determine whether the disputed movement certificate EUR. 1 or form EUR. 2 applies to the goods actually exported, and whether these goods can, in fact, qualify for the application of the preferential arrangements. When such disputes cannot be settled between the customs authorities of the importing State and those of the exporting State, or when they raise a question as to the interpretation of this Protocol, they shall be submitted to the Customs Cooperation Committee. 1. The Community and Malta shall take any measures necessary to enable movement certificates EUR. 1 as well as forms EUR. 2 to be submitted, in accordance with Articles 11 and 12 of this Protocol, from the day on which it enters into force. 2. The certificates of type A.M.1, as well as forms A.M.2. may be used until stocks are exhausted and at the latest up to and including 30 June 1977 under the conditions laid down by this Protocol. 3. The movement certificates EUR. 1 and the forms EUR. 2 printed in the Member States before the date of the entry into force of this Protocol, and which do not conform to the models in Annexes V and VI to this Protocol, may continue to be used until stocks are exhausted, under the conditions laid down by this Protocol. The Community and Malta shall each take the steps necessary to implement this Protocol. Those products accompanied by a movement certificate A.M.1. issued under the provisions previously in force concerning origin shall be considered as originating products, in the sense of this Protocol, provided that the said certificate was issued before the entry into force of this Protocol. The endorsements referred to in Articles 19 and 20 shall be inserted in the ‘Remarks’ box of the certificate. The terms ‘the Community’ and ‘Malta’ shall also cover the territorial waters of the Member States of the Community or of Malta respectively. Vessels operating on the high seas, including factory ships, on which fish caught is worked or processed, shall be considered as part of the territory of the State to which they belong provided that they satisfy the conditions set out in Explanatory Note 5. The percentage rule constitutes, where the product obtained appears in List A, a criterion additional to that of change of heading for any non-originating product used. Packing shall be considered as forming a whole with the goods contained therein. This provision, however, shall not apply to packing which is not of the normal type for the article packed and which has intrinsic utilization value and is of a durable nature, apart from its function as packing. of which at least 75 % of the crew are nationals of the Member States or of Malta. ‘Ex-works price’ shall mean the price paid to the manufacturer in whose undertaking the last working or processing is carried out, provided the price includes the value of all the products used in manufacture. ‘Customs value’ shall be understood as meaning the customs value laid down in the Convention concerning the valuation of goods for customs purposes signed in Brussels on 15 December 1950. (1) This rule does not apply where the use of maize of the ‘zea indurata’ type or ‘durum wheat’ is concerned. (2) This rule does not apply where fruit juices of pineapple, lime and grapefruit are concerned. (3) These provisions do not apply where the products are obtained from products which have acquired the status of originating products in accordance with the conditions laid down in List B. (4) For yarn composed of two or more textile materials, the conditions shown in this list must also be met in respect of each of the headings under which yarns of the other textile materials of which the mixed yarn is composed would be classified. This rule, however, does not apply to any one or more mixed textile materials whose weight does not exceed 10 % of the total weight of textile materials incorporated. to 30 % where the material in question is yarn of a width not exceeding 5 mm formed of a core consisting either of a thin strip of aluminium or of a film of artificial plastic material whether or not covered with aluminium powder, this core having been inserted and glued by means of a transparent or coloured glue between two films of artificial plastic material. to 30 % where the product in question is yarn of a width not exceeding 5 mm formed of a core consisting either of a thin strip of aluminium or of a film of artificial plastic material whether or not covered with aluminium powder, this core having been inserted and glued by means of a transparent or coloured glue between two films of artificial plastic material. (7) Trimmings and accessories used (excluding linings and interlining) which change tariff heading do not remove the originating status of the product obtained if their weight does not exceed 10 % of the total weight of all the textile materials incorporated. (8) These provisions do not apply where the products are obtained from printed fabric in accordance with the conditions shown in List B. (9) For products obtained from two or more textile materials, this rule does not apply to one or more of the mixed textile materials if its or their weight does not exceed 10 % of the total weight of all the textile materials incorporated. the value of products of undetermined origin. (11) This percentage is not cumulative with the 40 %. (1) This rule docs not apply when the general rule of change of tariff heading is applied to the other non-originating parts which are part of the composition of the final product. (4) The application of this rule must not have the elfect of allowing the exceeding of the percentage of 3 % for the originating transistors laid down in List A for the same tariff heading.